These are nothing special. Like nothing at all!! But, I did find a great little ingredient to help keep your melted chocolate staying ooey and gooey and easy to work with! I’ll tell you so you don’t have to keep reading. It’s palm oil shortening!! I’ll explain a little more later. I decided to make these Halloween themed and you can do any combination of dark, semi-sweet, milk or white chocolate. You can fully coat your pretzels or use a drizzle for decoration. There are also a few types of gluten-free sprinkles/decorations you can use. The ones that I used for these are not labeled gluten-free, but they did not contain gluten ingredients. So use your own caution when choosing sprinkles. Check out these cute sprinkles that are allergy-friendly. I’m totally getting these for our next birthday cupcakes! Ok, so moving on to the secret ingredient in these – palm oil shortening. 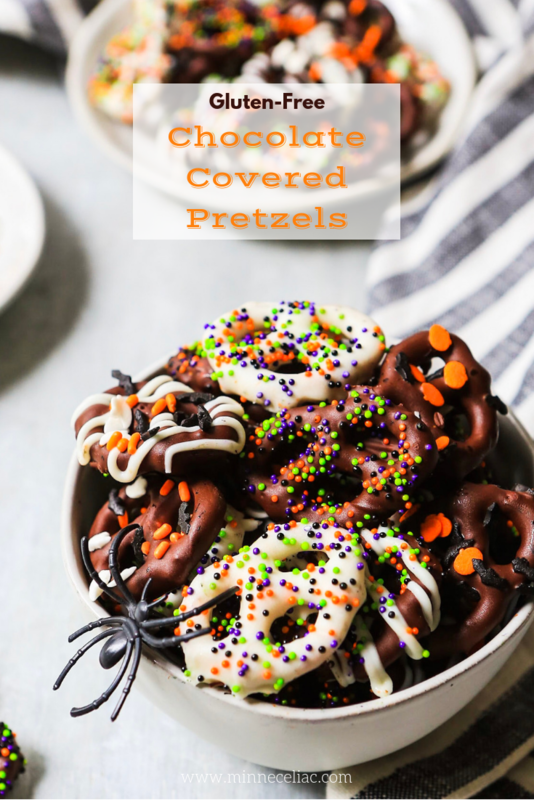 Sometimes the chocolate can get hard and clumpy and it doesn’t coat the pretzels smoothly. I have in the past seen people use coconut oil. The reason an oil like palm or coconut is so great is because it is liquid when it’s heated up, but then it hardens at room temperature. The problem with coconut oil is that it leaves the candy with a coconut-y taste. Sometimes you just don’t want that. So I decided to look if I have something else to use and I had some palm oil shortening that I use for my banana bread and muffins. I decided to give it a try and it worked like a charm. Plus, it’s flavorless! 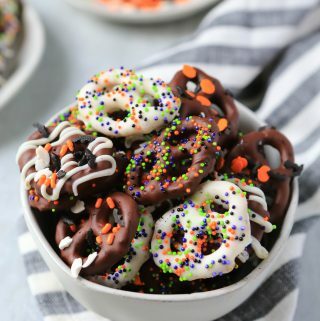 Here are some very simple instructions for making your own chocolate covered pretzels. 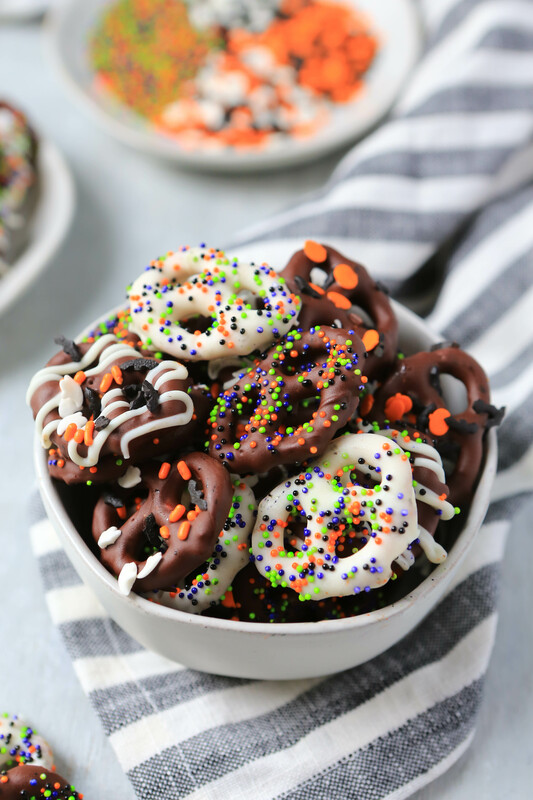 Chocolate covered pretzels are the perfect little treat to serve at a party or pack in your kids' lunches and they are easy to decorate for any holiday. So grab your favorite gluten-free pretzels, allergy-friendly chocolate chips and some sprinkles. That's all you need. You can pin this recipe by clicking on the image below.